When spinning with timecode you need to have the scratch panels in the Traktor deck visible. The scratch panels tell you what is going on with your timecode and you find the RST button there, which triggers the timecode calibration process. What you can see from the scratch panel and how to calibrate is explained in this tutorial. There seem to be more and more users of Traktor Scratch Duo who have problems making the scratch panels visible. This tutorial shows how you can solve this issue. Traktor Scratch Duo (other than Traktor Scratch Pro) has no option to activate the scratch panels directly. Whether the scratch panels are visible or not is part of the layout definition of the Traktor user interface. In Traktor Scratch Duo those layout definitions cannot be changed. Traktor Scratch Duo comes with two layout definitions where the scratch panels are enabled. The steps in section 'Method 1' show how you can get those layouts into your Traktor condifugration. In the case that those steps don't solve your issue, follow the steps outlined in section 'Method 2' and edit your Traktor configuration file directly. The following steps explain how to use the Setup Wizard to make the scratch panels visible. Start the Setup Wizard. To do this open the 'Help' menu and click 'Start Setup Wizard'. Open the list 'Please choose your device'. Select the option 'Audio 4 DJ - Traktor Scratch'. The Setup Wizard now integrates the defaulkt settings from the file 'Traktor Scratch Duo - Default.tsi' into your personal settings file named 'Traktor Settings.tsi'. 'Ext. Mixer (Scope)' and 'Ext. Mixer (Sync)'. If the scratch panels still aren't visible try the steps explained in method 2. Some users report that they still can't see the scratch panels, even when they ran the Setup Wizard as explained in the previous section. There is actually another way to enbale the scratch panels by editing the settings file directly. To do this use an XML editor because they are better in dealing with the long text lines that the settings file contains. Furthermore, make a backup copy of your current 'Traktor Settings.tsi' in case something goes wrong. Create a backup copy of the file 'Traktor Settings.tsi'. Tip: If you don't know the location of the file 'Traktor Settings.tsi' open the Preferences dialog in Traktor and select the 'Data Location' page. Click the browse button next to 'Root Dir' and you will see the folder where 'Traktor Settings.tsi' resides. Load the file 'Traktor Settings.tsi' into an XML editor. Search for an entry named 'Gui.Layouts2' in the tsi file. This entry contains the definition of all defined layouts. Each layout definition starts with the name of the layout, followed by a series if numeric values and it ends with a semicolon. Search for the key/value pair "20 0" inside the layout definition you want to change. 20 is the key for the scratch panels, and the value 0 (zero) means off and 1 means on. Replace the 0 (zero) behind 20 by 1. Make sure that you don't delete any blanks. 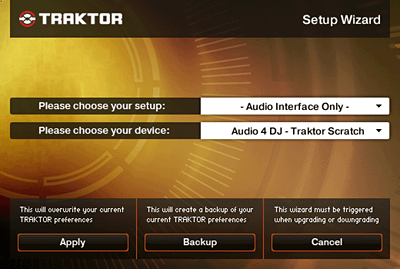 Save the file 'Traktor Settings.tsi' and restart Traktor. You want more detailed and practically information about Traktor? Check 'Traktor Bible, Second Edtion', the complete resouce for digital DJing with Traktor. Note: The information in this article is based on Traktor Scratch Duo, Version 1.2.1.7692.